When your brand is so iconic, off-the-rack apparel is not an option. 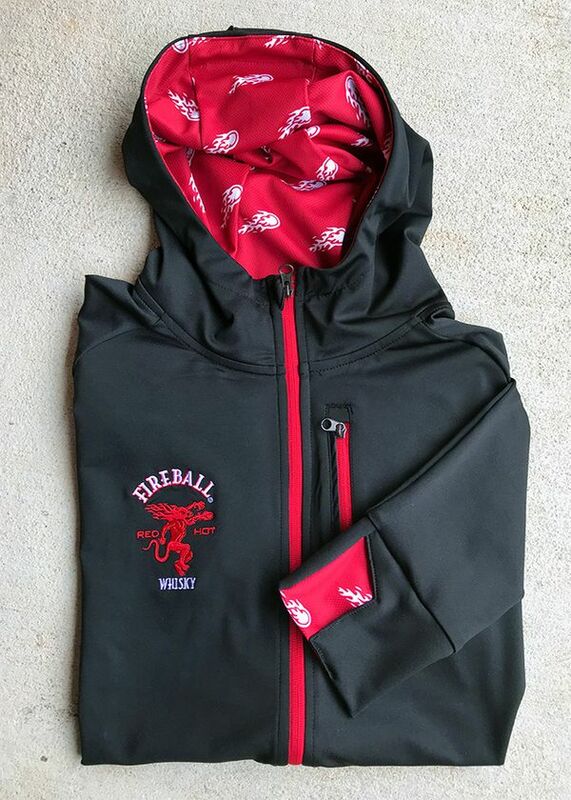 Fireball Whisky was looking for a unique hoodie to hand out as gifts to customers before the holidays. It was important that no one would be able to replicate the garment, making each one a true keepsake. We presented a number of concepts showcasing Fireball’s fire-breathing dragon and “fireball” icons. They settled a stretch fabric hoodie with a custom-printed red lining, embroidered chest logo, contrasting red zippers, and patterned thumbholes. After reviewing a couple of prototypes, the team at Fireball asked for some subtle changes and then turned us loose to do the rest. In a matter of weeks, the complete order was delivered to their warehouse. Fireball’s distributors and customer retailers were wowed by their gifts, but most likely not surprised. After all, the brand is known for being a true original.